Savoring Single – Because we were meant to enjoy it. What started as the testimony of my life has become a passionate message to challenge the status-quo of how to navigate being single as a modern-day Christian female! Why “Savoring Single”? Because we were meant to enjoy it! Finding purpose, knowing love and experiencing adventure aren’t reserved solely for the married girls! You can enjoy a full and vibrant life, even while being single. It’s also a perfect time to partner with what God wants to develop in you through this once-in-a-lifetime part of your journey! Girl, being single is okay. There is a purpose for it and it won’t last forever. So – savor it! I am so excited to be featured at RachelBritton.com for her #beboldseries! Click the image above to read more. Navigating this single life is tough. There are so many girls that are missing out on the life God designed them to live and the beauty they were formed to carry because they have internalized their singleness as a root of their identity. I know because I did too. This internalization produces feelings of rejection, insecurity, being unwanted, unloved and unattractive and being ashamed. There is also internal and external pressure that comes from influences like culture, family, friends, self, media, and so on… that leads to depression, lack of purpose, a tarnished identity and simply missing out on the good in the single season. My heart is to see girls not wait till they’re 20 or even 30+ before they realize how wonderful being single can be. We have this unique opportunity to pursue a deeper relationship with Christ, mature our perspective of the world, and to develop skills and abilities; all carrying us through every other season more prepared. A healthy perspective of single, a solid foundation of truth and a vulnerable approach of our relationship with Christ will reap benefits in our lives that cannot be measured, whether we are single for another 10 years, or get married tomorrow. Being single is not just about preparing for marriage, it’s about preparing for life. Being single is not just about learning to become a good wife for your future husband, it’s about being an accepted daughter. It’s not just about being single, it’s about living fulfilled in the purpose we were created for, no matter the season. I also feel that if we can meet her where she is at…while she is a single youth or young adult…we may reduce the fall out of those who graduate high school and leave the church. This may happen because they no longer have a genuine connection to the local church that carries them through the defining years of their singleness. So feeling left to themselves, they go and find themselves in the world, get hurt, broken, worn down and then look back to the church and God to find relief from all the pain. But now they are wrecked with shame and grief and the consequence of sin. Within the local church, somewhere between youth group and young families there’s a gap to be bridged and I believe it’s to our singles. If singles found this connection in your church, where their lives were noticed and their season was affirmed…we may be able to save some from looking to the world for an answer the church already has…Jesus. A relationship with Him, for every season! 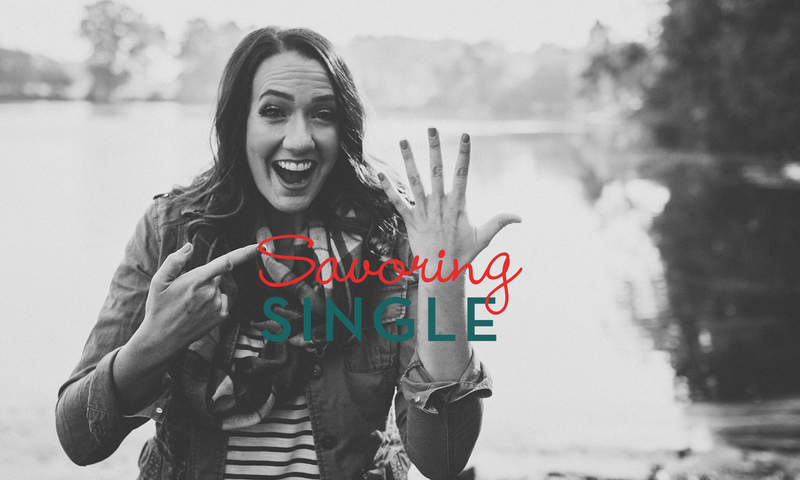 Savoring Single is a ministry to bring a message of truth, rooted in love, for hope and healing, while building genuine friendships and expanding the capacity to dream to a generation of young ladies that have a heart for God. A fresh perspective that sees the greater potential of our single season and broadens our capacity to dream in all areas of our lives. My name is Shelley Black. I am in my 30’s. Never married. No kids. I just knew I’d be the girl to get married young and have kids young and…well, I’m not the “young” I thought I would be. So, I let my life settle into a holding pattern waiting on that one dream to meet Mr. Right and get married. Even though I was raised by Christian parents and grew up involved in the local church, I became broken because I identified with my singleness and it changed my perception of God. Because of all those years that my hope was deferred, I felt rejected by Him, so lacked the ability to trust Him. My heart got cold and hard and though I was still a “good Christian girl” I was really hurting. Through the Word, prayer, worship and discipleship He has healed my heart of so many things through the years and has brought me to a place where I am now #savoringsingle. I gotta tell you, it’s so much better from the perspective of hope and trust! There’s a way to be genuinely happy, find purpose & enjoy this wonderful life we have….in every season! I have served my local church for 20+ years with a focus on youth, young adults graphics/media and worship. I have had biblical education and training from Rejoice Bible Institute (Olive Branch, MS), Victory Bible Colleges International (Santa Ana, CA), The Victory Church (Southaven, MS) and a Certificate of Ministry from 220i of Bethany World Prayer Center (Baton Rouge, LA). I also attended WorshipU at Bethel (Redding, CA). I have an Associate of Arts degree in Business Administration from Northwest Mississippi Community College. In addition to my passions in ministry, I have worked 15+ years in grocery and retail management. If you’re interested in having me come minister at your church or event, click here for the ministry invite form.